This is the only program you need to print unlimited quantities of any retail bar code. 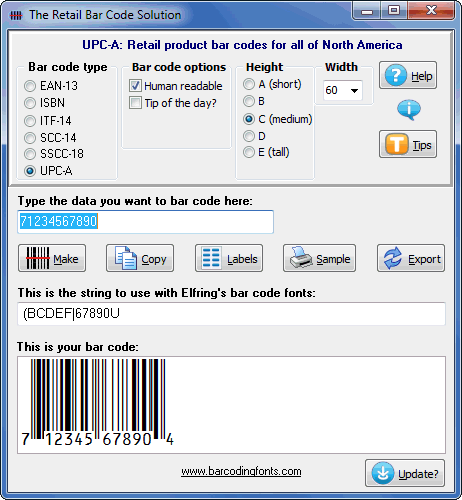 The package includes: UPC-A bar codes used on all retail products in North America, EAN-13 bar codes used on all retail products except those in the US and Canada, Bookland / ISBN bar codes used on all books, SCC-14 and SSCC-18 Shipping Container Codes, and ITF-14 (GTIN) bar codes. It's simple to use. Just select the type of retail bar code you want to make. Pick a height and a width for your bar code. Then enter your bar code number and click on the Make button. Your bar code will appear in the bottom window of our software. Our program will calculate and verify your checksum and make the bar code for you. You can print as many bar codes as you like, on labels, in your packaging, or even export the bar code in standard graphic formats and send it to someone else to print. Print labels. Printing sheets of bar code labels has never been easier. Just run our utility, Make your bar code, and click the Labels button. Then pick the label size you want to print on. Our bar code label templates cover all standard label sizes. Once selected, your label template appears in your Word processor, where you can add text and even graphics to your bar code label. View our flash tutorial to see just how easy this is to do. Create bar code images. If you need to send your bar code to someone else to print, our software will export your bar code in bmp, gif, jpg, or png formats. You have a choice of four different resolutions: 300, 600, 900, and 1200 dpi. Our bar code software lets you independently control both the height and the width of the bar code you are building. Make lots of bar codes. If you need to generate large numbers of bar codes we have the solution. This software includes Visual Basic macros that work directly inside Excel, Access, and Word to build your bar codes. For example, add our macros to Excel and you can make a cell with a new formula that builds retail bar codes directly from the data you want to bar code. This is an easy way to generate thousands of bar codes all at once. Free trial, tutorial, and manual. Need more details about this product? Try the flash tutorial first to see how to use our retail bar code software. If you have additional questions download the free trial version It has a complete 18 page manual, help file, and trial version of our retail bar code software and fonts. You can print and scan your own bar codes with the trial software. Or take a look at the product manual for The Retail Bar Code Solution.